Oh, my--is it really the end of September already? I am finally managing to squeeze in one last post for the month. I really do try to post twice a month, but I tend to procrastinate now that I'm retired and tell myself, "Oh, I'll do that tomorrow." Can you believe I have now been retired for a year? It's been a mixture of relaxation, changes, and sadness, to be honest with you. I still really miss my old coworkers and many (not all!!) of the patrons who used to stop by the Reference Desk to chat. But, most of my fellow librarians have also retired within this past year so I know it wouldn't be the same even if I were still working. On the other hand, I relish those lazy mornings when I can lounge in bed "just a bit longer" and not have to wake to an alarm and get myself off to work. I am still struggling with making the best use of my time and feel guilty when I don't accomplish as much as I would like in any given day. But, I try to remind myself that I've earned the right to relax--I raised three wonderful sons and spent 29 years serving the public at the library, right? I did manage to get a lot of stitching in this month and have caught up with my monthly Christmas ornaments. First of all, I'd love to share this gorgeous Prairie Schooler fall finish with you. It is called "Autumn Leaves" (Book No. 132) and is stitched on 40 ct. country mocha Newcastle linen with the suggested threads. For some reason, I rarely feel the need to change colors when I'm stitching Prairie Schooler pieces. I'm not sure if I'll frame this one or finish it off in some other way. On 40 ct. it really isn't that big so I'll have to think about it for a while. I really love everything about this finish--the fabulous fall colors, the cute little black kitty, and that funny gray squirrel scampering to the top of the oak tree on the right. 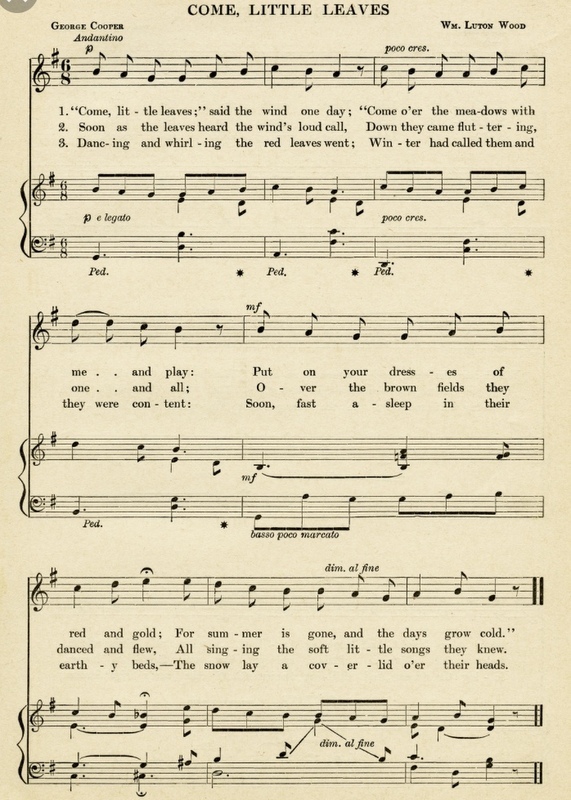 Did you know the wording is actually based on a poem "Come Little Leaves" by George Cooper? 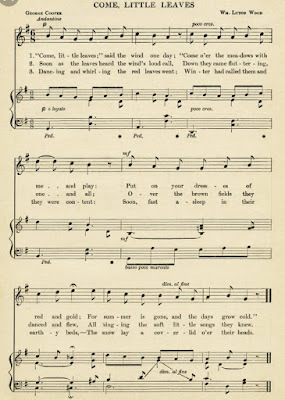 Later on, music was added... Now, when I was younger, I probably would have been able to play this piece on the piano. I took lessons for a few years in elementary school and then quit at the age of 12 when I thought playing piano wasn't "cool" anymore! My mother always told me I would regret it--and you know what, mom--you were right! Are any of you piano lesson drop-outs, too? Here are a couple of close-ups of the piece for you. The center square pictures a barn, but you can pick other motifs to stitch instead. After the fact, I wish I had picked the pumpkin motif to stitch. Oh well, I can always make a small pillow with the pumpkin design and display them together, right? Most of you know just how much I love black cats! For my long-time readers, the bottom portion of this sampler might look a wee bit familiar. Well, that's because I actually stitched it way back in 2012 when I was doing my "Bowl Of the Month" stitching and did this one for the October theme of black cats. I finished it into a little pin pillow which you can read about right here. There are lots of other cute black cat ideas in that post, too, if you are a black cat fan like me! My small pillow finish of the lower portion of "Autumn Leaves" from 2012. For my August ornament, I stitched another of the Little House Needleworks Farmhouse Christmas series. Let's see if you recognize it! I stitched it over one on 28ct. black Monaco and it really changed the look of "Grandma's Quilt." What do you think? And then to finish it off, I turned it on the diagonal, added some greenery, a small red bell, and my handmade cording. I just love it! September's ornament is from the new 2018 Just Cross Stitch Ornament Issue and is called "My Christmas Song" by MTV Designs. You know my love of cardinals (you can read about the special feelings I have for those beautiful red birds in this post) so I couldn't resist this one. I forgot to take a "before finish" photo, but this was charted as a rectangular design with red notes. I decided to make the notes black and I added more of them along with additional snowflakes so I could make an oval ornament. It almost looks like the fabric is printed that way, doesn't it? But no, it just started off as plain old 36 ct. pearl gray Edinburgh linen! I ruched some black and white gingham ribbon and added it to the edge along with some red pins. What do you think? So, on to my last three ornaments of the year--can you believe we are 3/4 done with 2018? On to my final installment of my Panama holiday... No, you won't be reading about any harrowing hikes this time... one was enough to last a lifetime! Today, I'm going to focus on the arts and the history of the country. 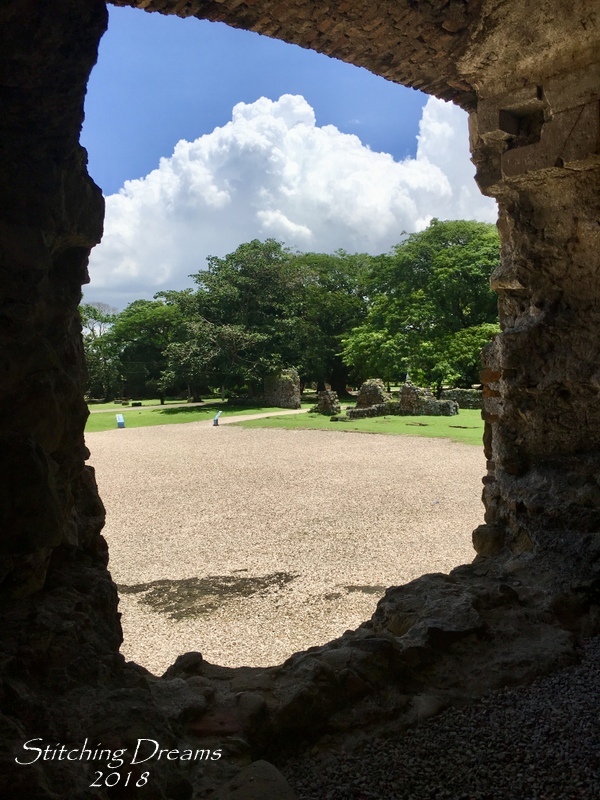 One of our most pleasant afternoons was spent in Panama Viejo which is the original site of Panama City and has been a World Heritage Site since 1997. Shortly after it was founded in 1519 by Spanish conquistador, Pedro Arias de Ávila, it became an important stop in the route used to transport gold and silver from Peru to Spain. 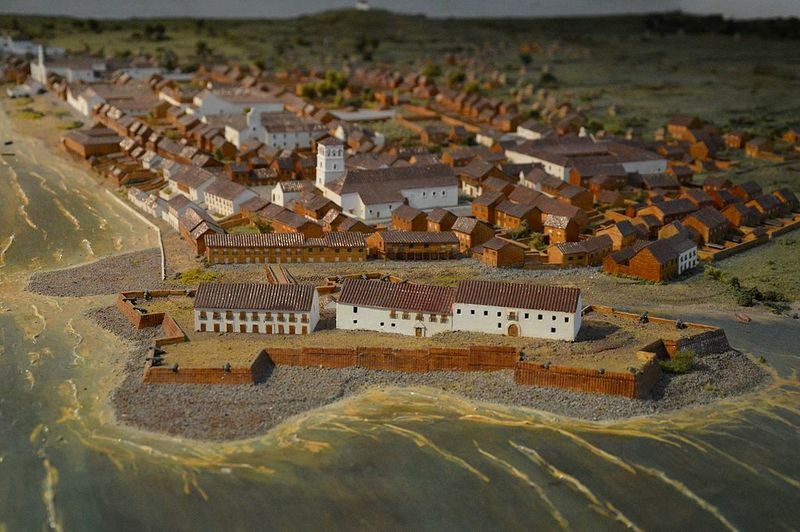 For over 150 years, the original city thrived and grew to resemble the village shown in the diorama below. However, in 1671, Welsh pirate, Henry Morgan, attacked the city, fires broke out, and thousands died. The survivors fled to a more protected area which is now the site of Casco Viejo (which I talked about in my first Panama post and where our Airbnb was located). Today, all that remains of the oldest part of Panama City are a few crumbling buildings. I love the juxtaposition of the ancient bell tower with the modern skyscrapers in the distance. The stairs of the bell tower have been modernized so we were able to climb them for a 360° view of both the old and the new. The tower not only housed the bells of the church, but also served as a lookout post. 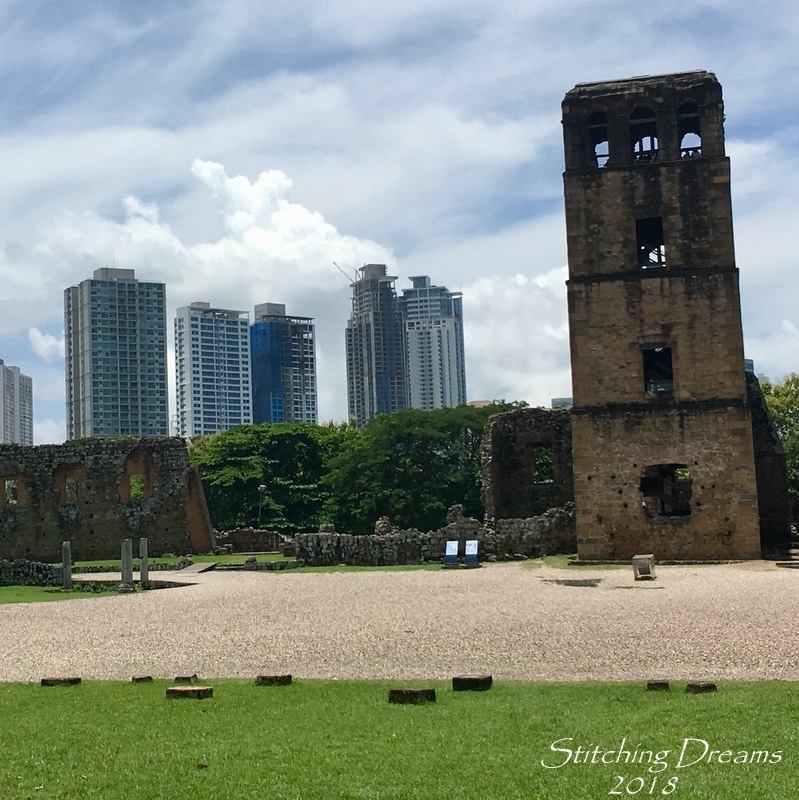 There was such a relaxed and peaceful air as we walked among the ruins of Panama Viejo. One of the things I was most interested in seeing in Panama were two groups of the indegenous people: the Emberá and the Guna (also called Kuna). Unfortunately, we did not get to visit the Emberá village that my youngest son had so enjoyed, but we were able to see members of the Guna people selling their brightly colored fabric molas at a local market. 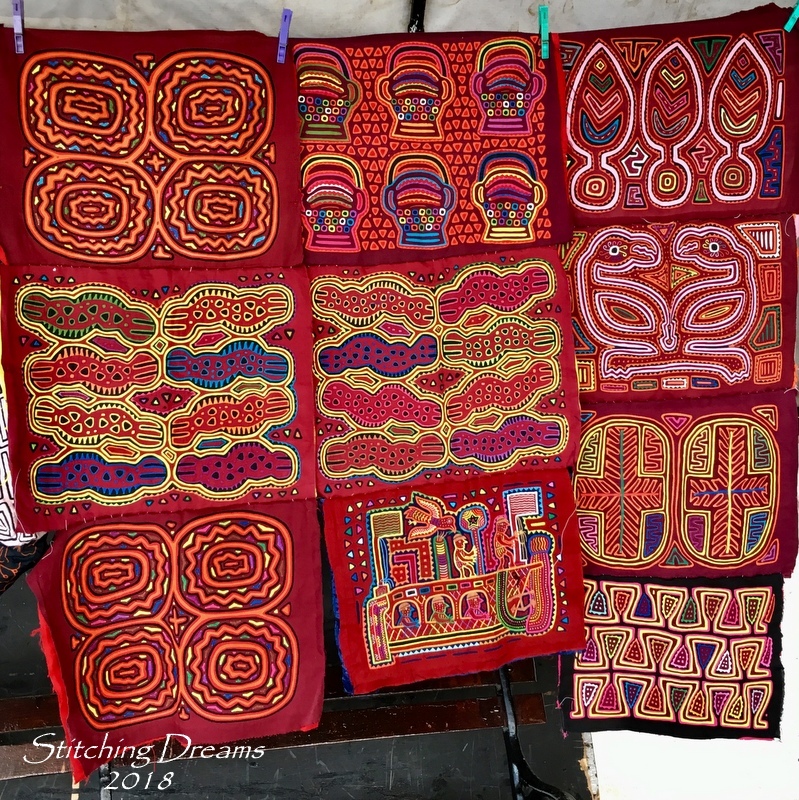 A market stall selling molas which are made from layers of cotton fabric using applique and reverse applique. The quality of a mola is judged by the number of layers of fabric used and the fineness of the stitching. A mola can take from two weeks to six months to make! Two Guna women chatting while selling their wares. The one behind the middle mola kept hiding each time I tried to take a photo. She would smile at me and then duck behind the mola as if she were playing peek-a-boo! 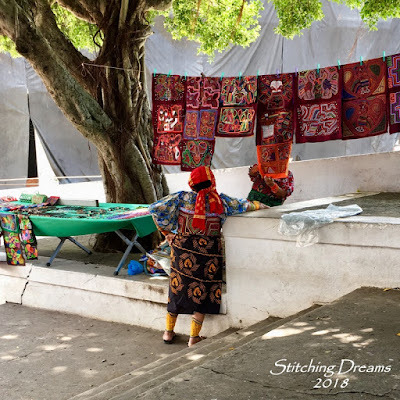 The molas are sold to tourists to be used as wall hangings or to make pillows. They are not to be made into clothing--that is something reserved for the Guna people alone. Here is a closer look of the brightly colored clothing of the Guna women. The scarf is called a "muswe" and is worn as a sign of respect. The beaded wrapping around the arms and legs is called "uini" and is made from yards of string looped through glass beads and wrapped around the lower legs and forearms in different designs. At the market we also saw piles of what we think of as "Panama hats." Did you know that authentic Panama hats are actually made in Ecuador? My son wanted a real Panamanian hat so he journeyed to La Pintada to buy a genuine "sombrero pintado." The shop was quiet that day so he said he enjoyed a nice chat with the owner (pictured above in front of his hats). The brims can be flipped up or down for different looks. For some reason, license plates were being sold in many of the booths at the market. I'm not sure if people use them for art projects or just purchase them as souvenirs. On our walk back to the Airbnb, I spotted this cute metal creation of a woman seated at a sewing machine! My youngest son had to work several of the days we visited so he suggested that we go to see a traditional Panamanian dance show on our own. Since he has lived at the hotel where the show was being held for the past six months, most everyone on the staff knows him--he is almost like a mini-celebrity! So, he made the reservations and they gave us wonderful seats--right up front with great views. Oh, the costumes were amazing! 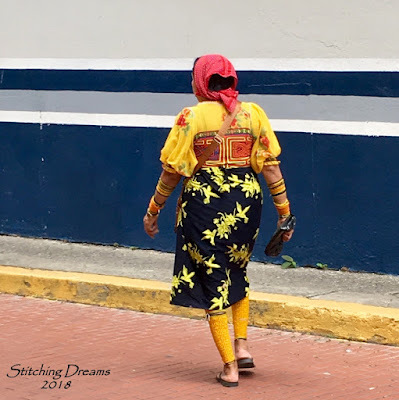 The girls wore more colorful, elaborate outfits, while the young men wore simpler costumes consisting of a long white shirt, britches, a crossbody bag, and a sombrero pintado. The girls dresses (called "pollera") can cost $300 to $3000 and are worn for festivals and holidays. They can take up to a year to make! Elaborate headdresses, gold jewelry, and pompoms complete the look. What do you think? Would we make it as Panamanian dancers? 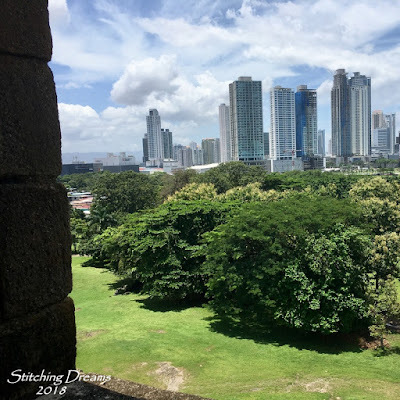 One of my most traveled friends once told me that it is the unexpected "finds" that you stumble upon during a visit to another country that will often bring you the most joy. Well, on our final night in Panama we just happened to walk into what was described as a restaurant that served "Panamanian traditional food." When we entered the restaurant, we were surprised to find that all but one table was already filled with diners who had made reservations. Luckily, the host gave us the lone remaining table. It turned out that every Saturday night there was a dance show included at no cost! The restaurant was called Diablicos and, as the name suggests, there were scary looking devil masks everywhere... The food was excellent and we had ringside seats to watch the dancers. An unexpected joy for sure! Here you can see a close-up of one of the dancers ready to entertain us. And then there were two scary male skull dancers--yikes! I shot a short 30 second video so you can see them in action. It seems to be traditional to pull audience members up at the end of the show to perform with the dancers. At the performance at the hotel they pulled my daughter-in-law up and at this show they brought up my youngest son! Thank goodness they didn't ask me! The following morning we boarded our plane back to the United States with so many wonderful (and one not so wonderful!) memories. I wish we had had a couple more days there to visit some of the memorable sights my son has seen since March. Luckily, we can imagine them through his photos and stories. Undoubtedly, the best part of my trip was spending time and making new memories with four of my favorite people. From hiking in the woods, to playing games at our favorite brew pub, to relaxing on the rooftop, to trying interesting foods and experiencing new cultures--it's so much more fun to have my family along for the ride. I'd say it's time to start planning our next family trip (and this time, I hope our middle son will be joining us, too!). Where should we go next? What was your favorite trip--either internationally or here in the United States? I'd love to hear your recommendations! Wow. What a view from that tower. Enjoyed the videos of the dancing and it looks like such a friendly and enjoyable place to visit. Thanks for sharing your adventures with us! I just love your autumn sampler with those lovely lines from the poem. So beautifully done as are the other pieces you show! Can you imagine that during all my years of doing cross-stitch patterns, I never made anything for myself to keep and only made gifts for others?! I would love to remedy that and thought I might make four pieces, one for each season. Are you able to tell me where you get your patterns from? Is there an online place to order them? I'd love to start with the autumn pattern. It's gorgeous! I see that you've really enjoyed your travels in Panama! What a wonderful experience! What a wonderful trip you had. Awesome pics you shared. Thanks. Your stitching is as wonderful as always. Love your August ornie. love your Autumn stitch Carol, and it really feels like Autumn here when we got back. Love your header stitching too the colours and the way you finished it looks wonderful. Lovely photos what a great holiday you both had . Hubby brought a real Panama hat back with him this year. what can i say --- your ornaments are so wunderfull! Thanks for the look in your holiday pictures! Your stitching is wonderful. I like all your finishes. The Grandmother Quilt finish is so great. Lovely photos from your journey. Autumn Leaves turned out beautiful, my fav Fall colors! And the Farmhouse ornament is gorgeous on black & turned sideways. Thanks for sharing pics & history of Panama. The sampler is just gorgeous, and I love the ornament you made from the JCS design. Oh my gosh, Care, I didn’t realize you made it to La Pintada! I love that guy so much! He’s so nice and proud of his work! I have one of his hats- and I wear it quite often in the summer. My famuly’s house in Penonome is about twenty minutes from La Pintada. Still feeling horrible about your hike from hell. I still love Hotel Anachoreo....that view. I love that we were both in Panama to share the experience. On, one of the pics you have from Casio Viejo is of sing/actor/politician Ruben Blades’ house. First off, yes, I'm a lapsed piano lesson person too. I think I quit earlier than you did. My sister continued longer, but probably quit when you did. I did take classical guitar lessons in high school, so that's something, right? lol! Love your stitching, of course, Prairie Schooler was my first love in cross stitch. Thanks for the lesson on where the words in that piece come from. I had no idea! Loved seeing the last of your Panama trip too! Tha dancing videos were fun! It's wonderful to be able to take family vacations even when your kids are grown and flown the nest, isn't it? Favorite trip for us? Well obviously, Maine. lol! And I love London too and hope to go back again someday. You made me want to visit, but I will definitely not go any hikes in the jungle. I love the first photo with the tall city buildings in the background. I loved seeing the wonderful colors of Panama, Carol. I know I would be most interested in the fabrics and crafts. ( the hiking not so much!lol) Love all your stitching but Prairie Schooler will always be a favorite. I love that you can do so many motifs from their designs. I keep each and every one of my PS charts. I just love them. I have the Leaves chart but that is one I have not stitched yet. Now I want to move it to the top of the pile but Christmas stitching is on my agenda for this week. Thanks for sharing your fun retired life with us. Carol, what a super post. I love your PS stitch and both of your ornaments. Thank you for sharing your trip of Panama. I totally enjoyed seeing it through the lens of your camera along with your son's. Beautiful stitched pieces and finishing. Hard to believe you're almost finished with another year of ornaments! I so enjoyed seeing Panama through your eyes. I'm not a traveler, but I do enjoy traveling through others! I'm sure to go to a beautiful country where you son knew his way around was a wonderful experience. Having several of your family with you was the icing on the cake!! The PS piece is lovely.Grandma's Quilt is gorgeous! I am so impressed with My Christmas Song. I love the way you did it! I never would have liked the pattern the way it was in the magazine! ;) Loved reading about the rest of your vacation Carol. I just know you all will be off on another grand adventure again. I can feel it. I can't wait!! Congrats on the adorable ornament finishes Carol. I really love your PS autumn finish. I really need to work on some of mine. Loved seeing your final trip pics. Looks like you had a great time. What fun it is to read about your fantastic trip. The videos are worth a thousand words! Of course your stitching finishes are always beautiful. Love the PS Autumn Leaves. Thank you for sharing a part of your life with us. Hi Carol - Thank You so much for sharing the rest of your visit to Panama with us. It really has been so wonderful to get to read all about it and see your great photos of this very amazing adventure. (I appreciate that the one “adventure” wasn’t the best but it was very interesting and you will probably be happy that you have pictures and words to remember this part of your visit someday.) (easy for me to say to you while I’m safe, warm & comfortable in my chair at home, isn’t it? Ha! Ha!). Anyway, it really seems like it was a great opportunity to see a different part of the world and share it with most of your family. I hope your middle son gets to go along with all of you sometime in the future. Just curious, how long will your younger son be in Panama? Will he be returning to the US sometime soon? What a wonderful opportunity he has had to be in different areas for his work, and it is very nice that you were able to visit there, too. As for your stitching - well, I love them all! The PS is beautiful! I think looking at many of the Comments on your site, we would all like to stitch this and have this piece in our homes. I, too, love just about all of Prairie Schooler designs. I have quite a few of the chart books and need to stitch more of them. Your stitching of LHN’s “Grandma’s Quilt” is wonderful. Stitched on black really makes it look very special and quite different - love it,too. I have to look at the 2018 Just Cross Stitch Ornament issue to see the MTV Design and see how you made it your own - your ornament is really beautiful. I love cardinals, too. This ornament is just perfect. Well, I see that this Comment is way too long so I guess I should end it and get it sent to you. Hope all is well with you and your family. Happy October to you. Hugs to you!! Carol: Your ornaments are beautiful, I love your finishing. The Prairie Schooler design is one of my favorites of theirs. Your vacation photos are amazing, I clicked on the dancers, the second one made me want to get up and dance. First, I love that PS design. You did a beautiful job. I'm looking forward to seeing how you finish it. The Panama pictures were so very interesting. I did so enjoy the pictures you took that tell a bit of the history of the country. Those dancers were quite amazing, and yes, the music was loud. (My DH asked me what I was listening to when I played the video)! You have some wonderful memories and pictures with your family! Of course when it comes to travel I love love the north east part of our country. A bit odd that I live so far from there! Loved hearing all about your adventure. Such a colourful place! Your stitching is exquisite as usual, Carol, and I love it all. I stitched the barn and the pumpkin squares from that chart as teeny tiny pillows. I will need to stitch the whole thing now but I don't think I have the skill to do 40 count. Can't wait to see how you finish it. Although my chart is decades old I see that they have reprinted this one and it is still available from 123 Stitch. Classic patterns never go out of style! Your Farmhouse Christmas quilt block is the most wonderful that I have seen. Thanks for the inspiration and also the history lesson! So special to have that family time. It's hard to believe that it's been a pension for a year - you're so active, it's not noticeable at all. Autumn Leaves looks gorgeous, so beautiful autumnal colorful. Even the small pillow looks pretty. Grandma's quilt is a good little hanger. Looks great, the Finsih. I'm also very excited about "Christmas Song". I love it. Again so great pics and stories from Panama, I enjoy reading your posts and sometimes it feels like I'm somewhere with it and can feel it. Thanks a lot for this. Panama is an interesting country, thank you for sharing! I wish for a beautiful October! 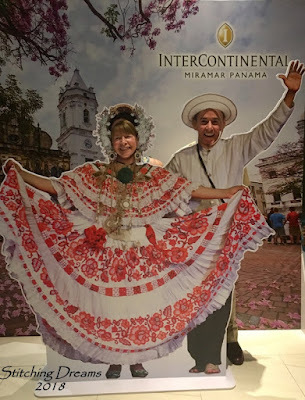 Thank you for sharing your Panama adventure Carol. The brightly colored woven pieces in the market - wow! I would not know where to begin shopping. What a beautiful place with a rich and colorful culture. You are very fortunate to have been able to visit there; well minus the hike! Autumn Leaves looks gorgeous and I love your little quilt square ornament! Beautiful stitching! The August ornament looks lovely:) I enjoyed the pics and details about your trip. 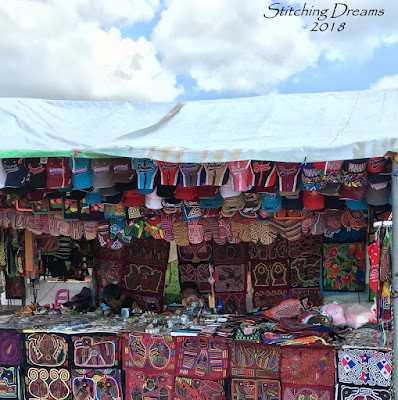 Gorgeous stitching and lovely photos from your holiday. I'm so glad you enjoyed the majority of it! What a nice looking family you have, Carol. The trip looks like it was a wonderful one. I have only been to places here in the country but loved the Grand Teton's over in Wyoming. Your finishes are always amazing. I love your finish of the newer ornament; I wait for the magazine to reach my local grocery store, that is where I find it. Those crazy conquistadors, always looking for riches. They wandered all over the southwest US looking for gold and silver. I think you'll get in the rhythm of retirement eventually. It's something I'm looking forward to! Beautiful finishes! They all look amazing of course. Thanks for sharing your Panama experience. I enjoyed traveling along with you to a place I will never go. Your photos are fantastic. 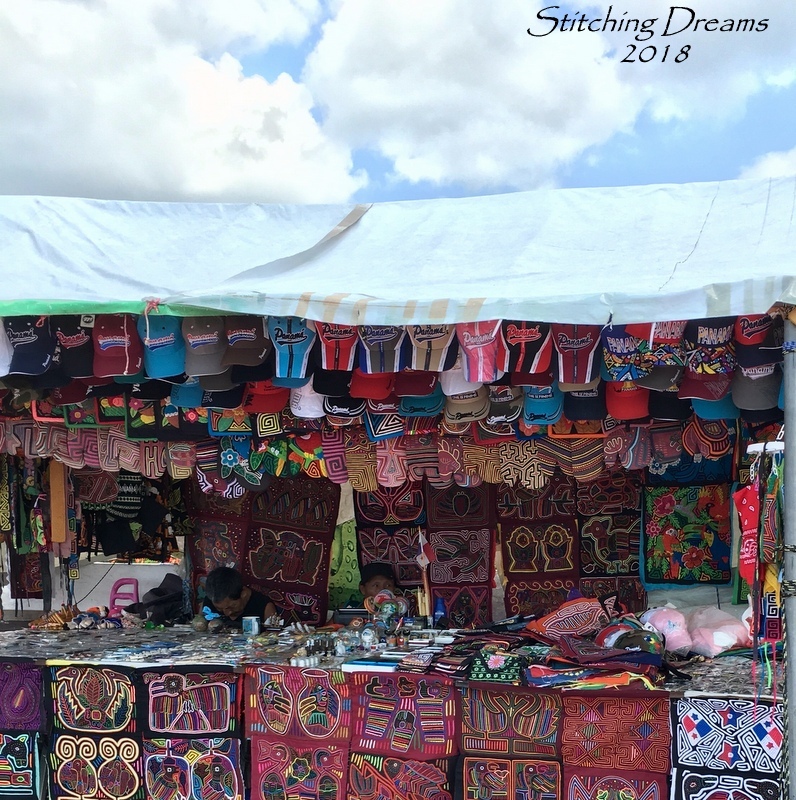 Great stitching update, Carol! 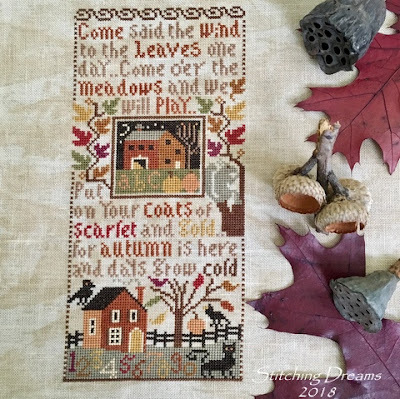 Love the Autumn Sampler! Grandma's Quilt ornament looks so nice on black! The bird ornament is so lovely! I love that PS piece but I have not done it yet. Beautiful job! Love all your adventure pics! oh, how wonderful your autumn finish "Autumn Leaves" turned out, thanks for the close-ups. Your preparations for Christmas are also worth seeing. And your last vacation photos of Panama have totally impressed me, thank you very much for that. The Panama hats are my favorites. I dance salsa in my spare time, but the Panama dancers are also very good at it. Wow, Carol, so much awesomeness in your post from the stitching to the ruins to the costumes and dancing to the collage of photos at the end! I aspire to be like you when my kids are grown and hope they will enjoy adventurous, active vacations with family! 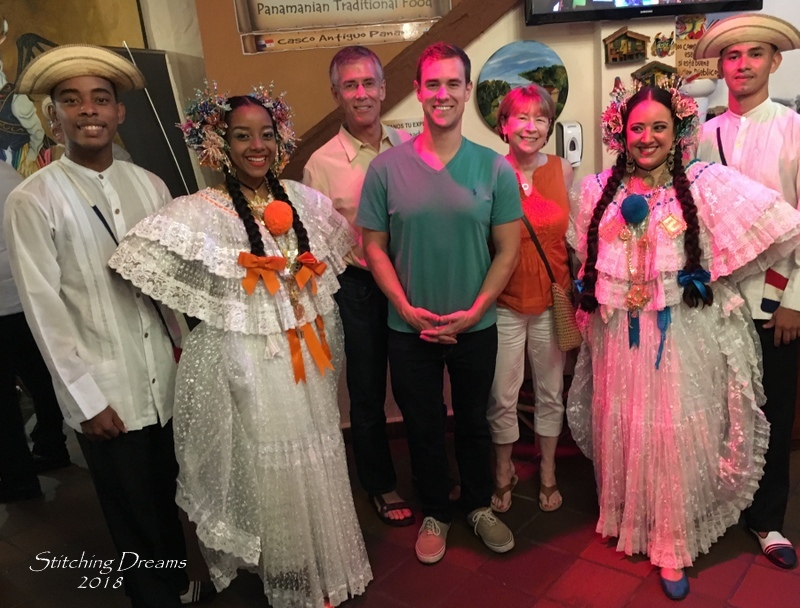 The culture and history of Panama is so interesting, thanks for sharing it with us, and thanks for taking us along on your trip! We are still on the early side of big trips in our lives, but there are a few places I’ve loved - Germany in the mountains outside Munich and in the cutest town I’ve ever seen - Rothenburg, Northern Michigan with the beautiful lakes and gorgeous sunsets, and from our trip last summer, Capitol Reef National Park in Utah. If you’ve never done the epic western road trip with stops at national parks and monuments along the way, I highly recommend that one! Hope your October goes well! Beautiful new header pic when your blog opened and then it only got better with each lovely ornament and the autumn PS is fabulous. Stunning photographs you shared of your lovely trip, such a lot of exciting things you shared from your experiences there. 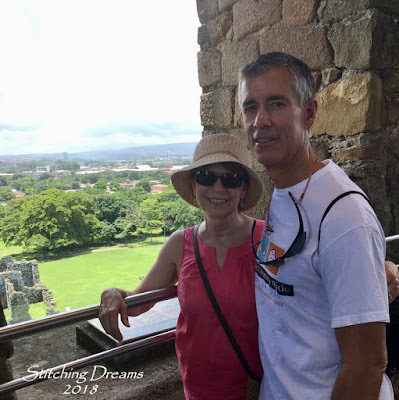 Carol, what a fabulous post - you write so well and the photos are amazing, I truly feel as if I have visited Panama myself now. Maybe you and your family could come visit Australia - so many wonderful sites to see here. hugs, Kaye. P.S. I love your Autumn Sampler, I am about to run to my stash to see if I have this one. Ahh, what an adorable kitty! But can you imagine a crow of that size sitting on your roof! A little terrifying; are you sure that isn't a Halloween piece!? The link back to the black cat post is so adorable! I love, love, love the Cat o'Lantern pattern and have something new to watch out for. I have not heard of Silly Snobs Gallery before and gotta love all those cats! I never received formal piano training (no money) but through a few years in band in middle school, I can at least read music. Small, rural school didn't have a ton of options so I started on the French horn and switched to a cornet. Wish I had stuck with the French horn! I really wish we would've had string instruments though... I would love to play a violin or viola now. Lovely old ruins you've visited. It doesn't look like anyone else was there though! That tower served as a lookout tower but what could they see through the trees? Or perhaps the area was cleared out back then. The molas are very intricate and I love the metal seamstress! Wow, you've been a busy girl! Your stitching is fabulous and looks very time consuming but relaxing. Your vacation is amazing you sure saw and did a lot, thanks for sharing your pictures that's whats fun about meeting new people through blogging. 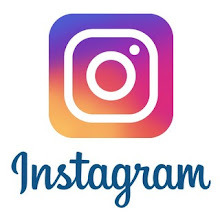 It's a nice way to connect with others around the world and share what we do. I will be showing the same PS stitch (Autumn Leaves) in a post very soon! I stitched and finished it last year, just before I started my blog. I'm like you - I included the little house, and afterwards - AFTER I finished it - I realized I could have chosen any of the square motifs. I remember your little pillow and I was inspired by it. I had not thought to stitch only part of a chart for a project. Some obvious things that should seem so simple totally escape me sometimes. I took piano lessons from first grade through my senior year. I got pretty good, but I don't have the natural talent others do. I have an electric piano now and I do play occasionally, but I'm not nearly as good as I once was. The piano I grew up with is an upright grand, player piano made in the early 20th century. It weighs about 800 pounds, so it will stay at my mom's house indefinitely. 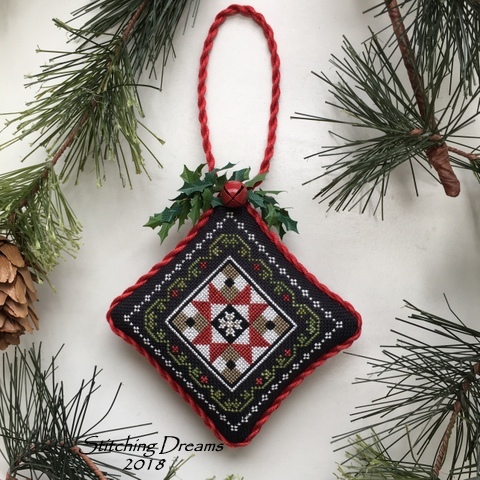 Your "Grandma's Quilt" ornament is divine! Love the black fabric! And the "My Christmas Song" ornament is lovely. I would love to see a close-up photo of the ruching. My breast-cancer stitch in my last post was the first time I had tried ruching ribbon, and I'm curious to see how it would look if I didn't gather it so tightly. Have a great week! Sending big hugs your way. I can't believe how fast the year is going! Great stitching, I adore how lovingly you finish your ornaments. I'm very glad to hear the remainder of your trip to Panama was nice and relaxing and the scariest bit were those devil masks and skull dancers! I think my favourite trip was Ireland last year - I am sure we will return soon, as for us it's not a very long journey to get there. The nature was just breathtakingly beautiful and the people are so nice and relaxed! What a lovely finish of Autumn Leaves. Love your ornament finishes, especially the quilt piece on the black. Have enjoyed going to Panama with you … well not the hiking, perhaps I'll leave that bit. Thank you for sharing. I am just catching up with my blogs. I cannot believe it is half way through October. Your finishes are just beaitiful. Being retired takes an adjustment, so I am told. You will find a new rythm. The pictures of your trip are so pretty. What a blurr this year has been. Christmas is around the corner.